No one likes paying taxes. 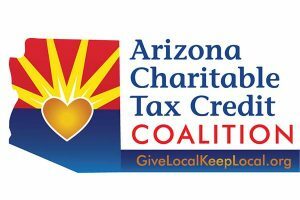 Luckily, in Arizona you can direct the taxes you pay toward charities that meet certain qualifications, such as a primary mission of serving the working poor. Our Family Services qualifies as a Working Poor charity. In 2016, for every dollar you donate up to $400 (or $800 for couples filing jointly), you will pay a dollar less of the taxes you owe the State of Arizona. That is a dollar for dollar credit, which means that you are directing your tax dollars to the charity of your choice! This is different than a deduction, which reduces your taxable income. 2.) The Working Poor credit can be used in addition to the Foster Care credit. You can take advantage of both! There is no reason NOT to give to families in crisis this season! Thank you for your generosity and do not hesitate to contact Emily at 520-323-1708 ext. 425 or ebrott@ourfamilyservices.org with questions. Please consult your tax advisor for additional information specific to your situation. * Contributions of any amount are helpful and appreciated. $400 and $800 are maximums per the State of Arizona. ** The amount you donate, up to these limits will be deducted from the tax liability you owe the state, or added to your state refund if you don’t owe taxes this year.